The Recorded Version of the Workshop will be available soon ! The most desirable aspect of any software development organization is to build high-quality applications with faster time-to-market. Organizations whether small, medium or large size, spend significant sums to ensure that their teams have the best tool environment to work with and there are almost no productivity losses and delivery delays. However, in a real-life scenario this is not truly achieved. Many organizations are yet to get the most out of their tool investments and follow a streamlined development process throughout a project lifecycle. The bottom line is that management does not have a clear understanding of who, what, why, how, when and where of the details of development activities going on in a project. This leads to the sheer uncertainties about delivery deadlines, estimated project cost and ROI. In order to achieve this, organizations these days are constantly investing on more tools, processes, and people. For stakeholders of a release as well as management, it is extremely necessary to get the benefits out of this distributed environment. How to give users the power of automation, real-time connectivity, and productive work environment. An integrated ALM platform with centralized data repository supporting cross tool end-to-end traceability, process and data based intuitive reporting mechanism can help them manage the entire product lifecycle from within their preferred tool environment. An ideal scenario would be to achieve this, without the need to replace any existing tools or spend huge amounts at ALM infrastructure costs on a recurring basis. The familiarity with existing tools also saves training cost and new tool investment cost. Organizations that use homegrown tools, vendor specific tools or a combination of both for their geographically isolated teams, therefore, need to realize the importance of collaborative software development, real-time notifications, and predictive metrics. How do you rate your existing development setup and identify the pain points? How do you address your development challenges and increase tool efficiency? What is Application Lifecycle Management – ALM and what it means to you? How simple is it to create a unified ALM environment around your teams, tools, and customers? How easily can your development setup become a profit center from a cost center? 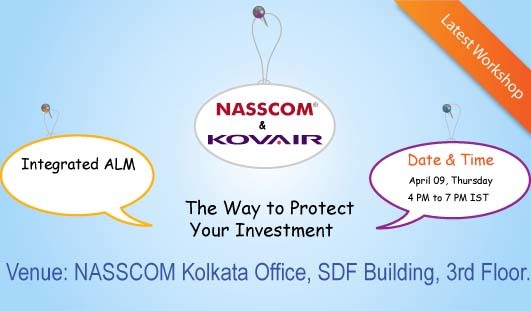 With this workshop, Kovair intends to create awareness about maintaining an integrated development setup that includes synchronized teams, synchronized tools and a streamlined business process with the power of automation. Sayak Roy, Sr. Software Engineer – Solutions and Services, Kovair Software, Inc.
Sayak specializes in Corporate Solutions and Services at Kovair. He leads enterprise level projects for various companies in India and outside. Sayak has directly worked with some of the leading multinationals such as OpenText, Cisco Solutions, and many others to implement ALM solutions in their setup. Configuring customized solutions to satisfy customers’ ALM use cases of various complexities is his core competency. He also takes a keen interest in writing blogs.